Egg shells are alkaline, while coffee is acidic. When added to coffee, the egg shells remove much of the bitterness and mellow out the flavor. Egg shells are also used in making campfire coffee – boiling loose grounds in a pot of water – because the shells help keep the grounds in the bottom of the pot. In modern coffee pots you don't need the shells to hold down the grounds, but you can still use them to reduce the acidity in your morning cup. Crack one or both eggs into a small dish. The number of eggs you use depends on the size of your coffee pot, how much coffee you are making and how much you want to cut the acidity. One egg is good for a small pot – four servings or less. Two works with four or more servings. If you are making gallons of coffee, such as with a percolator, consider using as many as six. Rinse out the shells with hot water. Set them aside. Scoop the desired amount of coffee into the coffee pot, percolator or coffee maker. The amount you use depends on your personal taste. On average, you should use one scoop per 6-oz. cup. Crush the egg shells in your hands and add them to the coffee grounds. Brew the coffee as you normally would. 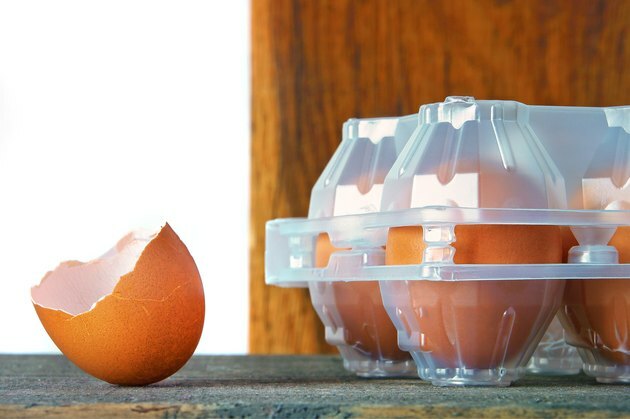 Use fresh, raw egg shells. Do not use the shells from boiled eggs. Cooked eggs release sulfur compounds which can permeate the shells and flavor the coffee.